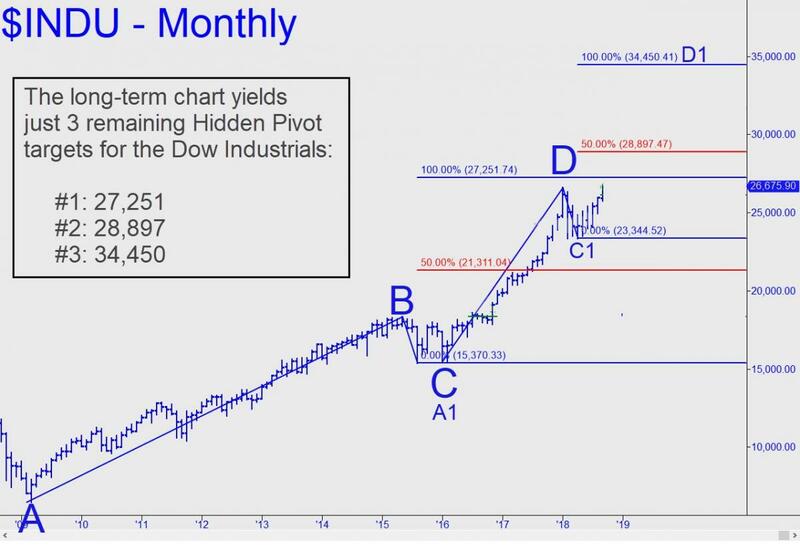 A subscriber who qualifies as a Hidden Pivot ace broached a Dow rally target at 40,000 Thursday in the chat room, but I’m not keen on encouraging such speculation. Applying Hidden Pivot analysis to the long-term picture, I can make a case for a move to 34,450 but no higher. Even then, bulls would need to get past two formidable Hidden Pivot resistances at lower levels. They lie, respectively, at 27,251 (just 600 points above current levels! ); and at 28,897. Either looks sufficient to turn back the bullish herd, at least for a while, and both are capable of ending the bull market. The ace Pivoteer, David Isham, has filled in for me at times and knows his stuff. His high confidence in the 40,000 target is based on the fact that it would represent a 1.61 [sic] Fibonacci extension of a regular Hidden Pivot target. He says there’s plenty of evidence to support the use of the 1.61 [sic] calculation in conjunction with Hidden Pivot levels. While this may be so, it doesn’t justify ballyhooing Dow 40,000 when there are such compelling targets at lower levels. That said, if my 28897 pivot were to be decisively penetrated I’d become a raving bull, at least until 34,450 was achieved. And if that last resistance were to get bulldozed, I’d join David’s camp enthusiastically.